Newly built in 1996, this beautiful and challenging 18-hole championship course in Sherburne has 6589 yards and is a par 71. Designed by Gene Bates, the course is carved out of the Green Mountain National Forest, featuring straight and narrow tree-lined fairways and quick, firm, undulating greens. Green Mountain National plays host for Vermont's only professional golf tournament, yet with four different tee levels on each hole, golfers of all abilities can enjoy this magnificent course. To warm-up before your round, Green Mountain National has a putting green, sand and chipping area and a driving range. The clubhouse also offers a restaurant and full bar. "Regardless of how the round has progressed, pause for a moment on the 16th tee to admire the panoramic view of Vermont's distant peaks and pastoral beauty. It's a view that can take away the sting of crooked tee shots." Hawk will be more than happy to arrange for tee times and transportation to and from any of the above courses. 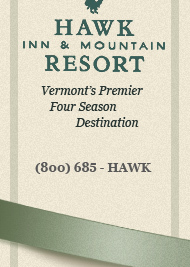 Simply make your wishes known to our concierge or call (802) 672-3811 for more information.